When you bring your business to The ROCC, you get the best of everything. The ROCC combines modern work amenities with a second-to-none location in one of Southeast Michigan’s most desirable communities. 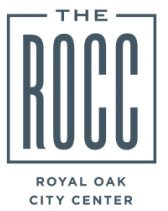 ​Part of a unique private-public partnership, The ROCC is at the heart of everything downtown Royal Oak has to offer.